This holiday season, I found myself in the hostess seat for the first time. Nick and I hosted our families for Christmas Eve (you can read all about that in this post), and we threw a post-Christmas party for our friends as well. I quickly learned that when hosting, comfort is key. You need to be able to dart around the house making sure that your guests' glasses are filled, pictures are being captured (hello, photo booth! ), and your husband isn't burning down the kitchen. For our party with friends, this skirt-and-tee combo felt the right amount of casual and festive, mostly because there is a bulldog on this shirt and he is wearing a gold bow (fancy!). I added more holiday flair with a red lip and sparkly strand but kept things comfy with my everyday ankle booties. In the process, I learned another thing about hostess dressing: Dark colors are your friend. I spilled meatballs all over this skirt and except for a few witnesses, our guests were none the wiser. J. Crew tee (sold-out but more bulldog-printed tops here and here). Frenchi skirt (plus another option). Sam Edelman booties (similar). BaubleBar necklace. David Yurman bracelets. Lips: Nars in Dragon Girl. Nails: Julep in Florence. 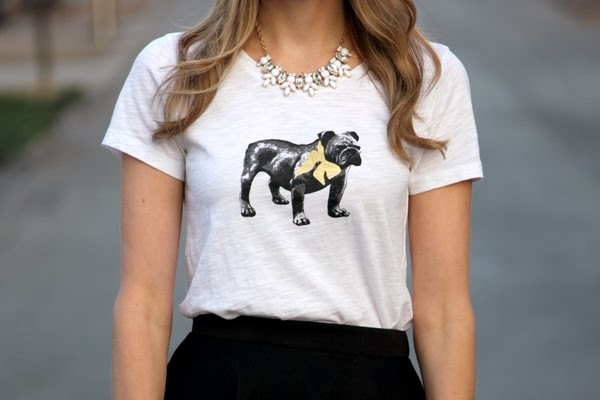 Such a pretty outfit, I love how the bulldog adds just the right amount of quirk! I wish you could have been there, too! We missed you, Jacky! Thanks, Jenny! The best part is that it's only $28! Adorable outfit, of course I LOVE the doggy t-shirt. At my holiday party I also spilled some meatballs, but on my shoes! oops! This top is too adorable!! love how your paired it with a simple little statement maker necklace and skater skirt. LOVE that shirt - usually I'm too afraid to wear something like that! But you have the best style sense!